Consumer spending by America's large middle class is an important indicator of economic recovery. GDP numbers from last quarter and opinions from the Federal Open Market Committee may not be as accurate an indicator of the health of the middle class economy as are the results of Starbucks last quarter. The sale of a cup of coffee seems like a meaningless thing, but experts report that more than 110 million Americans drink it and total national consumption is more than 300 million cups a day. Part of the reason that so many people pick coffee over other beverages is the health benefits. Medical experts say that modest consumption has physical effects that range from slowing cognitive decline in the elderly to an improvement of the level of serum cholesterol in the blood. But, it is more likely that coffee is attractive because it is a legal stimulant, a drug without a warning label. 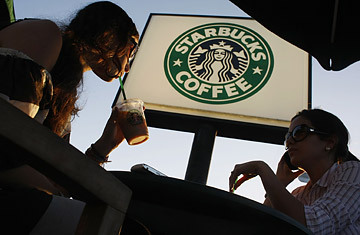 A number of analysts of consumer behavior thought Starbucks would be decimated by the recession. Consumers would stop going out and would brew their coffee at home to save money. That theory failed to take into account the social bonding aspects of going to Starbucks. It is psychologically and emotionally comforting during distressing times to be in the company of friends and neighbors. Starbucks has set up its stores so people will linger. Four dollars for a cup coffee is expensive, but four dollars for comfort is not. Starbucks started to get in trouble three years ago when its now-departed CEO said that the chain would eventually have 40,000 locations worldwide. It was an arrogant prediction given that Starbucks was not even half way there. Investors and customers saw that the firm's plans were grandiose once the leading edge of the recession hit Starbuck's business. The stock was punished and so were the company's employees. Last July Starbucks fired 12,000 people. That action broke an important bond with the employees who worked at the company, at fairly low pay, and the company's customers who viewed Starbucks as a socially responsible firm that would err on the side of people and not profits. The barrista concept gave these employees a sense of self worth and that translated early on into impressive customer service that always seemed genuine. The Starbucks model reminded many Americans of the 19th century European coffee shop where conversation and relationships flourished. Starbucks substantially altered its relationship with its employees and the image that its customers had of the company. But, Starbuck's brand has escaped the damage of the layoff of 12,000 employees, relatively unscathed, if the modest drop in traffic is an indication. The lesson is that people will visit a beautiful home even if the owner has evicted his own mother as long as the home is well managed, and the company and cuisine at dinner are excellent. See the top 10 worst business deals of the past year.